I know, this sounds quit silly but I have seen far bigger corporations stumble into problems before than Dreamworks Animation. The reason I come up with this assumption is because I have noticed something unbelievable: a Photoshop Disaster. Made by Dreamworks. Or is it a (C)? I don’t know. 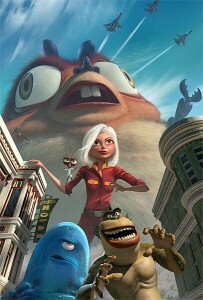 The movie I am talking about is the upcoming MONSTERS VS: ALIENS, due in 2009. For this seemingly interesting movie they started to create first promo materials – or better: one which they recycle many times.